Despite the emergence of high-throughput interaction methods within the last decade, there is still a strong need for careful and accurate measurements of affinities and thermodynamic parameters of single interactions in order to fully dissect the mechanisms of binding. To this end, isothermal titration calorimetry (ITC) is a well-established and convenient label-free technique covering a broad range of affinities. 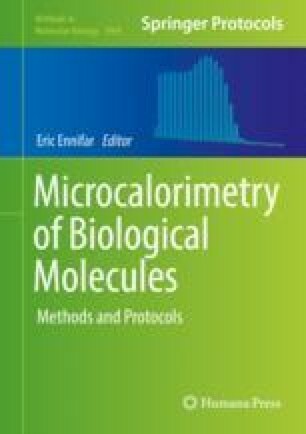 This review describes the careful use of ITC in the context of protein/peptide interaction in order to measure thermodynamic parameters of the binding with high accuracy and reproducibility. The relative medium-to-low affinities often encountered for protein/peptide binding imply to increase the concentration of the peptide and/or the protein, making the sample quality and data acquisition all the more critical. This chapter emphasizes more specifically the relevance of those points to improve the reproducibility of ITC measurements and to gain high-quality thermodynamic parameters. This work was supported by the Association pour la Recherche contre le Cancer (ARC) (no. 3171), and the Agence Nationale de la Recherche (ANR- MIME-2007 EPI-HPV-3D). J.R. was financially supported by ANR. We warmly thank Georges Mer for critical reading of the manuscript.